It’s been awhile since I’ve blogged about one of my favorite gluten-free companies out there. I think the giant, larger than my arm, loaf of challah bread and a couple of goodies I got to go with it were the last thing to cross my freezer from Katz Gluten Free. I have been moving away from processed foods, but that doesn’t mean I don’t splurge every now and again. I forgot what took me over to the Katz Gluten Free Web site awhile back. Perhaps I just wanted to take a browse. Perhaps I had a feeling that they had added some new products that would immediately make me fill up my cart and then eagerly anticipate their arrival a couple of days later. Whatever it was that drew me over there…it worked. Because they did have new products on the site. And I did immediately order them. And I don’t…because I know I can get better…fresh from my very own local gluten-free bakery…or…from Katz Gluten Free. Well, color me happy and surprised (which is apparently yellow and orange) when I just randomly darted over to their Web site and looked at their New Products page. Lo and behold there…on the screen…were not one…not two…but THREE new versions of their fantastic, super-delicious, gluten-free donuts. My heart skipped a beat, my hand reached for my credit card…and all three new varieties were purchased. I didn’t bat an eye. Hey, I love being healthy, but every girl deserves a donut every now and again. And this Celiac really loves donuts! The three new varieties offered by Katz Gluten Free are Pumpkin Pie Spiced Donuts, Triple Chocolate Donuts, and the Glazed Chocolate Donuts. This is one of those days where a quick breakfast is more than appreciated…it’s necessary. So, despite having these for a couple of weeks in my freezer, I have resisted diving in. But today…was a good day for donuts. I asked my roommate to pick a flavor and she immediately replied with the Katz Gluten Free Glazed Chocolate Donuts. She is a sucker for glazed donuts. So…I had a feeling that flavor would either be the first to go or the last one eaten. She went for it first. I actually pulled the donuts out of the freezer last night and placed the two I needed (one for my roommate and one for me) into a plastic bag to thaw overnight. The rest were returned to the freezer for another day. I don’t need to eat them all right now? I can savor them this way. The following morning, all they required was a little zap in the microwave (although even that isn’t necessary, I just like to give them that “fresh & hot” feeling to them. And then…brekkies was served. As a child raised in Upstate New York…one of the best treats ever was a Dunkin Donuts Munchkin (aka: donut hole). And, for as much as I can remember about how those tasted, that’s the memory these donuts drew up for me. The donut itself is a rich chocolate cake donut that just melts…literally melts in your mouth. Talk about a dream. The glaze is this sugary sweet bonus that just ties it all together giving it that little bit of texture and that extra boost of flavor. Just…beyond wow. And, even more…it brought back memories of sitting down to one of my favorite treats as a kid…donut holes from Dunkin Donuts. I mean…exact same flavor profile and texture to them. It was almost like eating cake for breakfast. Chocolate to the max…and just…Mmmmmmmmm….delish. I am glad I pull these out ahead of time and eat them away from my apartment or I’d probably be tempted to go back and eat another one. And maybe another one for good show. It’s nice to have a treat every now and again. These are a treat worth indulging in from time to time. TRUST ME! While this may not be the healthiest of breakfasts, you gotta treat yourself every now and again. I love fitness and I love eating clean and healthy foods, but I also like to indulge every now and again. Some mornings, you just eat a donut. Let’s talk about ingredients. 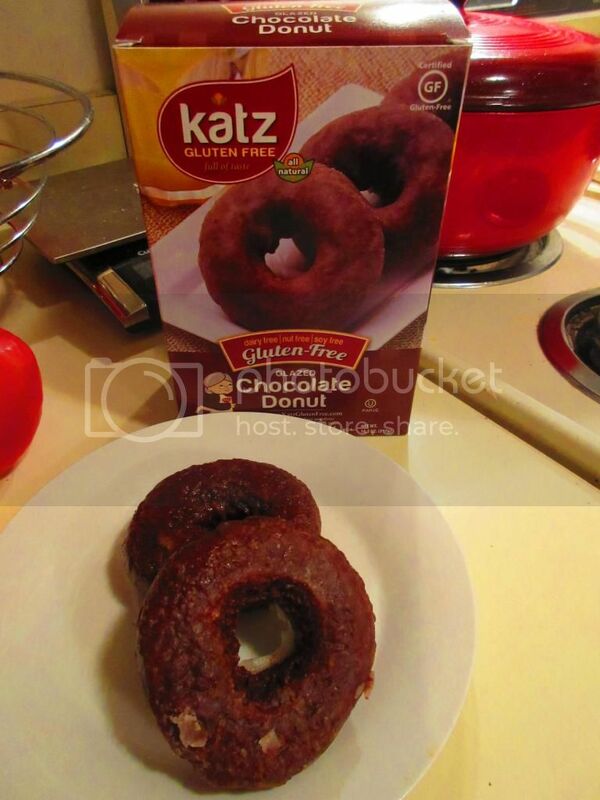 Katz Gluten Free Glazed Chocolate Donuts are made from gluten-free flour (a blend of tapioca starch, white rice flour, and corn starch), water, palm oil, sugar, eggs, confection sugar, canola oil, cocoa, baking powder, salt, xanthan gum, natural vanilla extract, agar, calcium carbonate (anticaking agent), and calcium sulfate (stabilizer). I know…I see the chemical sounding things on there too. But…this is a treat this morning. I definitely don’t eat donuts every day. In fact, it is a rare thing these days. These donuts are gluten-free, soy free, dairy free and nut free. As for nutritional information…for donuts, these stack up rather well. In fact, better than most donuts out there. A serving is 1 donut. Nailed that. This one donut will provide you with 210 calories and 12 grams of fat. Okay…the fat is high…but it’s a donut. You will also be taking in 20 mg cholesterol, 220 mg sodium, and 12 grams of sugar. And because these are donuts, and mostly comprised of sugar, they will definitely not be filling you up. In fact, one donut has only 1 gram of fiber and 1 gram of protein. I ate mine with an orange. I have only love for the products I have tried from Katz Gluten Free. They were the first company to bring me gluten free donuts that tasted like…real donuts. They have fantastic pies…good cookies…amazing bread…and I could go on. But if you are really looking to treat yourself every now and again…buy the donuts. Just…take a chance. Because, trust me…you will want to keep a box of these stashed in your freezer for those “Mmmm…donut!” days. And now, I have the Katz Gluten Free Glazed Chocolate variety to add to the mix. And they have exceeded my expecations for sure. I know that Katz Gluten Free only puts out quality products, but this was just exceptional. For those days when only a donut will do…you better not be without the Katz Gluten Free Glazed Chocolate Donuts. Stock up. And savor. These are definitely donut love for sure. SO GOOD! This entry was posted in Baked Goods, Breakfast, Cake, Chocolate, Dessert, Donuts, Food, Frozen, Gluten-Free, Products, Review, Snacks, Sweet Stuff, Vegetarian by The Celiathlete. Bookmark the permalink.